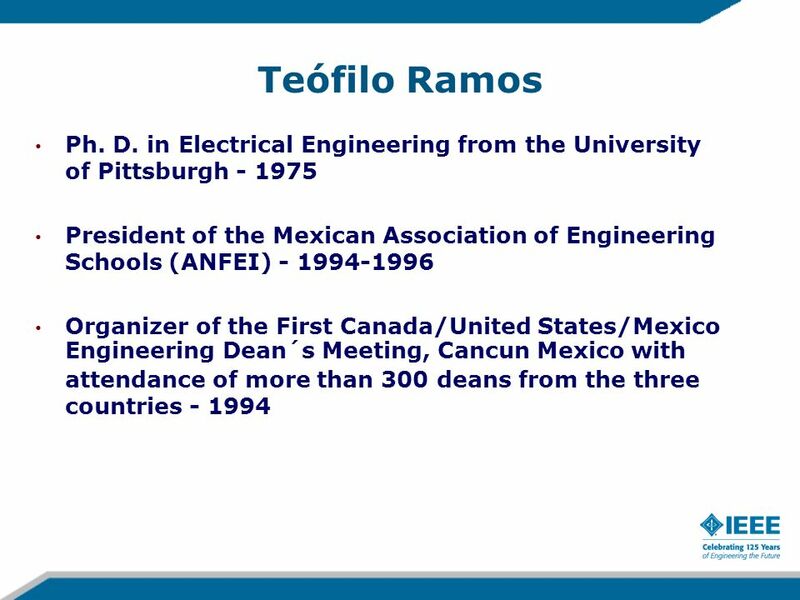 The 2009 IEEE Educational Activities Board Introduction Teófilo Ramos Vice President Educational Activities 14 February 2009 San Juan, Puerto Rico. 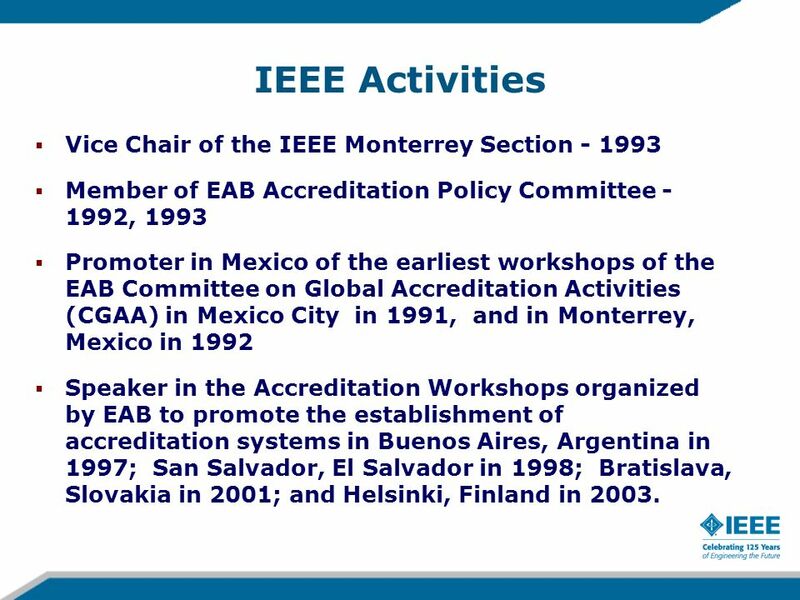 5 IEEE Activities Vice Chair of the IEEE Monterrey Section - 1993 Member of EAB Accreditation Policy Committee - 1992, 1993 Promoter in Mexico of the earliest workshops of the EAB Committee on Global Accreditation Activities (CGAA) in Mexico City in 1991, and in Monterrey, Mexico in 1992 Speaker in the Accreditation Workshops organized by EAB to promote the establishment of accreditation systems in Buenos Aires, Argentina in 1997; San Salvador, El Salvador in 1998; Bratislava, Slovakia in 2001; and Helsinki, Finland in 2003. 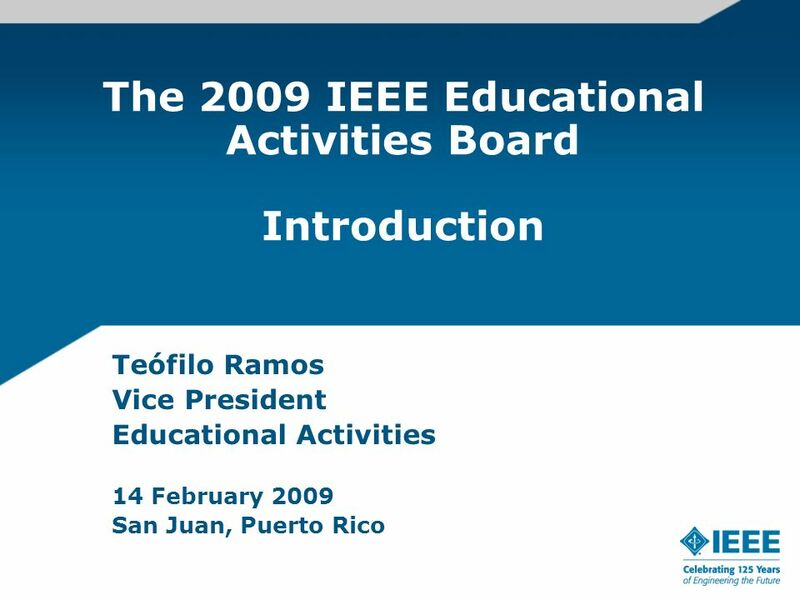 Download ppt "The 2009 IEEE Educational Activities Board Introduction Teófilo Ramos Vice President Educational Activities 14 February 2009 San Juan, Puerto Rico." THE ACE NETWORKS: IDEALS Past, Present, and Future Rhode Island Network April 25, 2003. 1 1 Summary of Activities in the Meeting Series An update for EAB OpCom Moshe Kam, Educational Activities 15 June 2007. Educational Activities Mark J. T. Smith ECEDHA President For ECEDHA (ECE Department Heads Association) November 17, 2007 EAB Meeting, Boston, MA. 1 EAB progress during the Meeting Series 17 November 2007, OpCom/FinCom Moshe Kam. 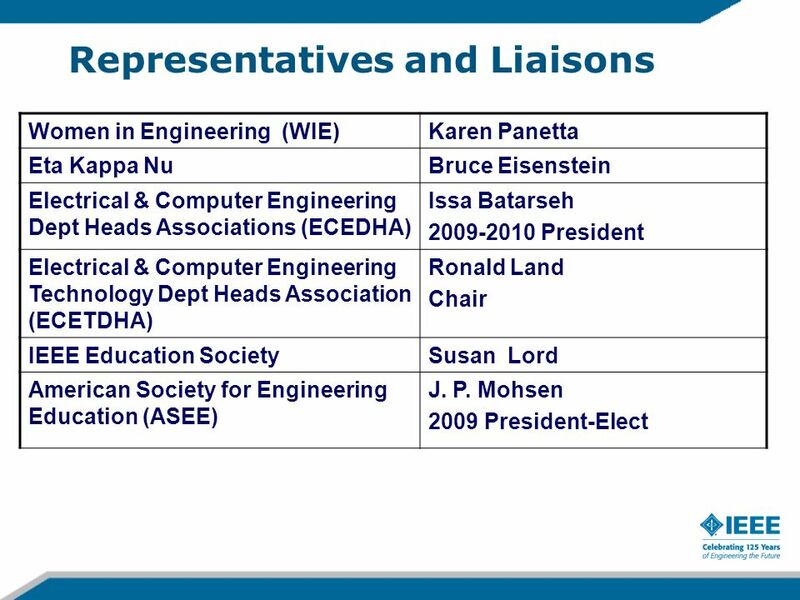 IEEE EAB AWARDS AND RECOGNITION COMMITTEE EAB Meeting 17 November Bruce A. Eisenstein, Chair. Educational Activities Mark J. T. Smith, Purdue University ECEDHA President June 21, 2008 EAB Meeting, Denver, Colorado Gerald Kane, The University of. 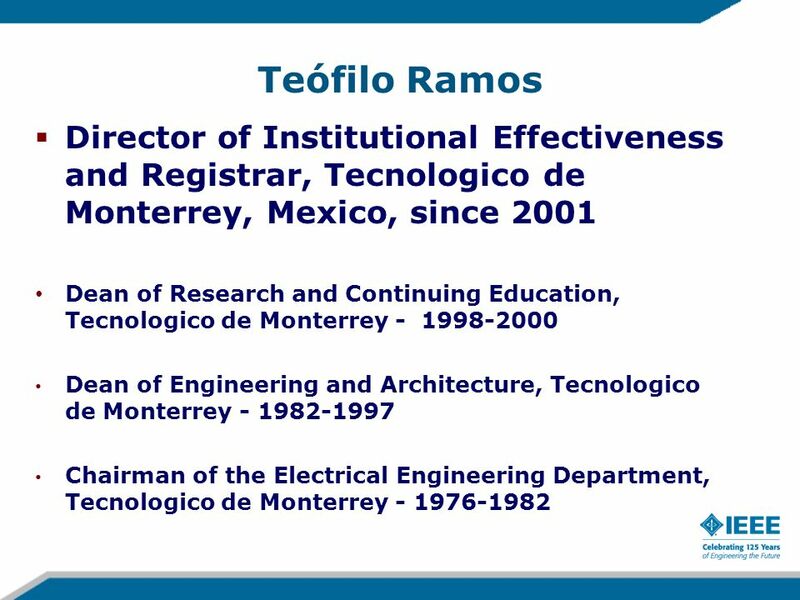 1 Report from ABET Inc. 21 June 2008 Moshe Kam Alternate ABET Director Denver, Colorado. Sections Outreach Committee (SEOC) – 20 June SEOC Meeting update Antonio Ferreira – SEOC Chair For EAB 21 June 2008 Denver, CO, USA. 1 The Committee on Global Accreditation Activities 16 February 2008 Moshe Kam, Chair CGAA Presentation to EAB Louisville, KY.
IEEE Educational Activities Services & Resources for Sections and Chapters Membership Development Retreat 29 April 2005. 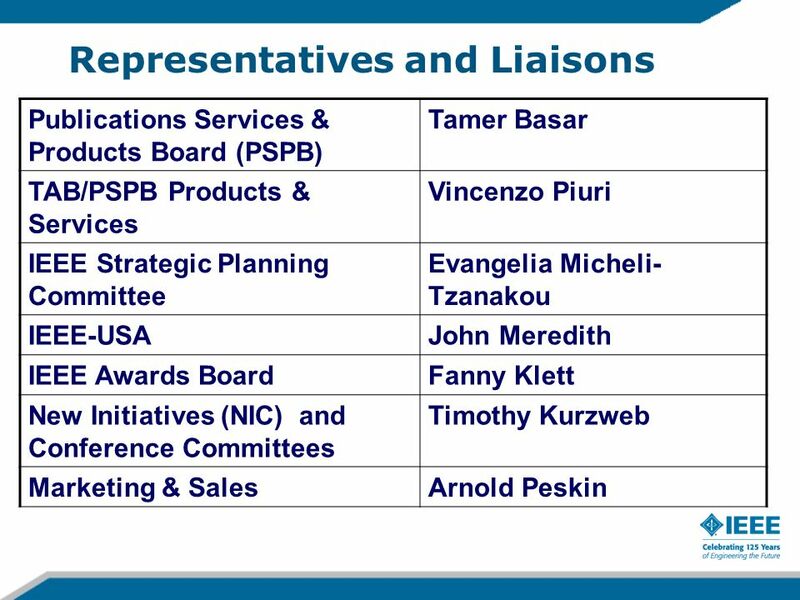 IEEE Expert Now Editorial Board Update Tamer Başar February 2008. 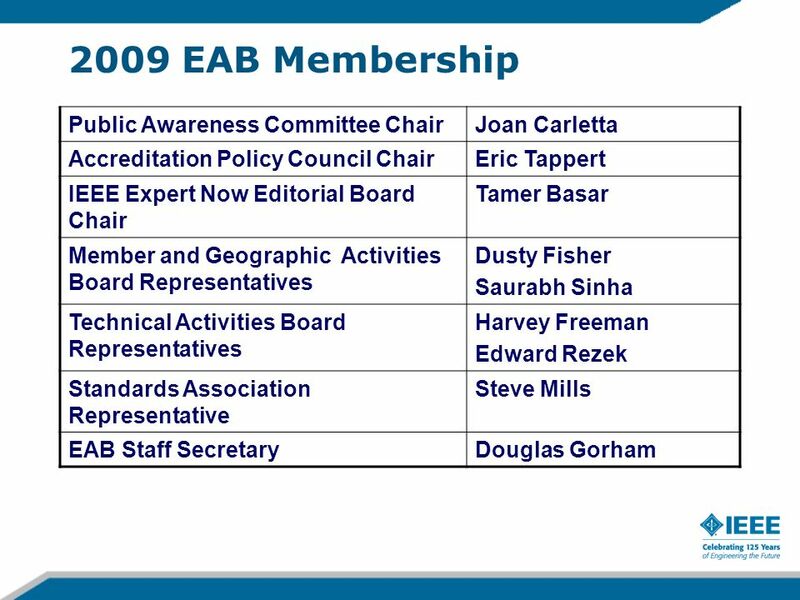 EAB Accreditation Policy Council (APC) Report to the EAB Eric Tappert, APC Vice-Chair 16 February 2008. Standards Education Program Steve Mills Chair, Standards Education Committee 15 November 2008. 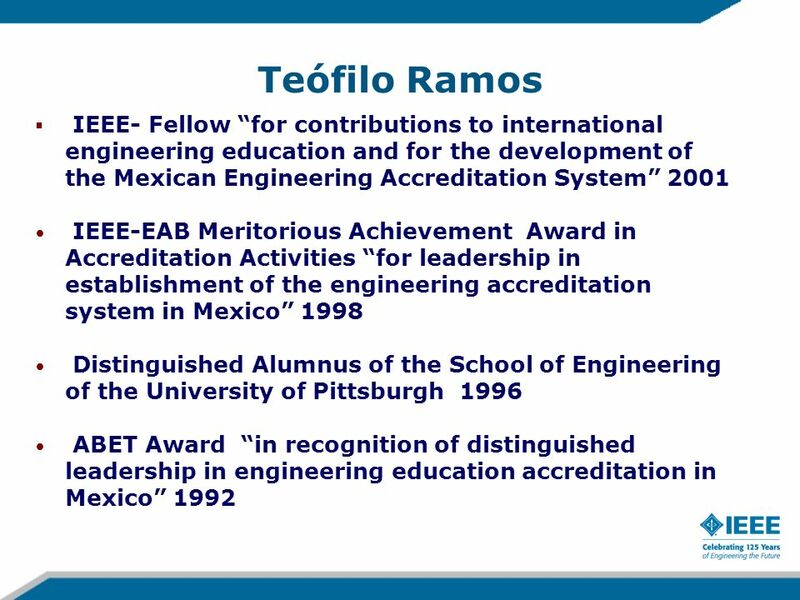 Educational Activities in 2009 Teofilo Ramos. 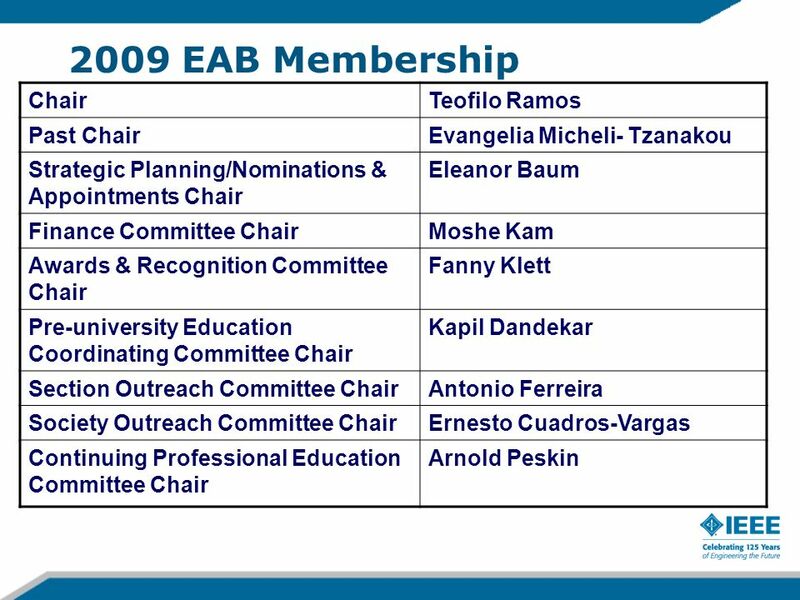 Educational Activities in 2009 Continuing Education Continuing Education Portal: EAB initiated an effort. 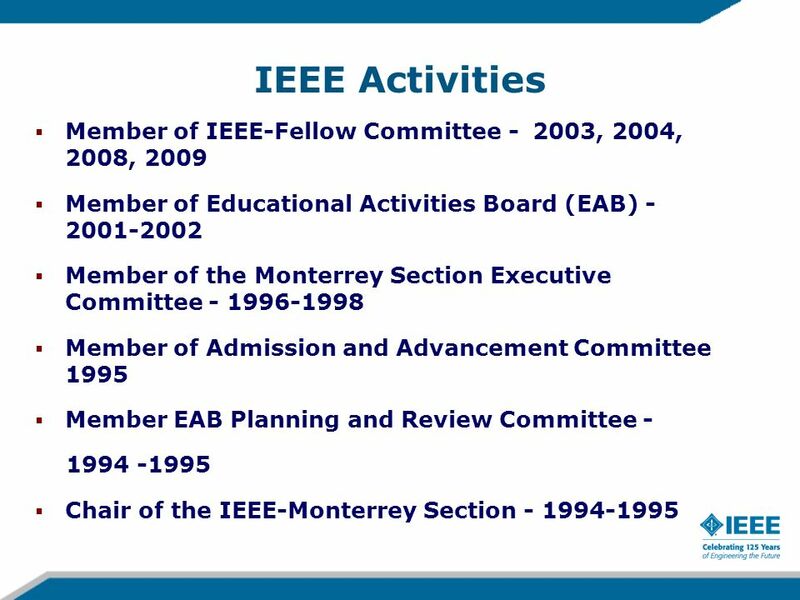 Report of the Managing Director, Educational Activities Department Douglas Gorham June 2008 Denver, CO.
12-CRS-0106 REVISED 8 FEB 2013 1-3-20141 IEEE Region 8 - past and present Martin Bastiaans IEEE Region 8 Director Presented at the IEEE Region 10 Committee.